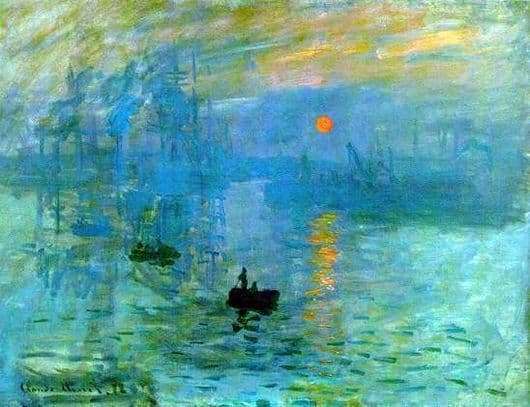 Monet’s work “Impression. Sunrise “was created in 1872 or 1873. She gave the name to a separate direction in art. The object of the image was the port of Le Havre, which is only slightly indicated by light strokes. Due to this, the viewer can not only enjoy his beauty, but also assume the continuation of the mysterious image. The painting was first presented at the independent exhibition of the Impressionists in 1874. Criticism of Louis Leroy so inspired the name of the work of Monet, that he wrote an article ridiculing the exposition, in which he called the artists impressionists. What is translated into Russian means impressed. The article was published in the newspaper “Le Charivari” and was called – “The Exhibition of Impressions” or in other words: “The Exhibition of the Impressionists.” Now – she would not be interested in the people, but then it seemed to everyone such a name is very funny. In protest, the Impressionists chose this word as the name of the group. Monet, like other impressionists, paid much attention to color. In the painting “Impression”, the artist depicted both the sun and the sky equally dull, which gives the viewer a feeling of dampness and morning twilight. But surprisingly, Monet wrote it with bright colors, without weakening their saturation at all, which could not have surprised and interested the viewer. It should be noted that the reflections of the sun in the water and the luminary itself are depicted in one color. If you make a picture in black and white, these images will almost disappear from the canvas. At the moment, the picture “Impression. Rising Sun “is in the museum Marmottan. It contains a large number of paintings by Claude Monet. In 1985, work was stolen from a museum, and it was succeeded to return it only in 5 years. Since 1991, the masterpiece again pleases the audience in its former place.